Hey hon, are you looking to find a mattress in Maryland? B’lieve me, we know it can be daunting. Whether you’re interested in a custom built mattress, memory foam, eco-friendly or economically friendly purchase, we have you covered. We took a look over some of the highest ranked mattress stores in the state and divided our review by region. Below you will find some of the best mattress shops for customer service, price, and quality. If you need to find a mattress in Baltimore head to MiY Home in Fells Point (1605 Eastern Ave.) where you’ll find a great selection of mattresses, bedding and more for your home. This is a fun place to shop, and the sales team will not pressure you into a purchase you are going to regret. If you like supporting local business, try MiY! Additionally, there is a Mattress Firm conveniently located in almost every neighborhood in Baltimore. The two we want to highlight are on opposite ends of town. Mattress Firm Canton is known for its great selection, knowledgeable sales team and affordable pricing. You can even secure next-day delivery. The other location is near Baltimore in Towson. Mattress Firm Towson (813 Goucher Blvd) is a great place to shop as a student or otherwise. If you head in during one of the major holidays they regularly have discounted mattresses. If you are looking for a great deal on a mattress you could try Mattress By Appointment Baltimore (6417 Harford Rd) where you will find overstock prices. Whether furnishing a dorm or a home, there’s a great value here. 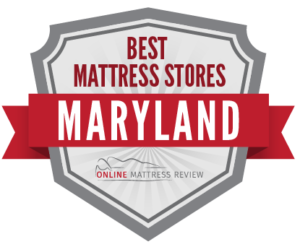 Are you wondering where you can find a mattress store in Columbia, Maryland? We can certainly help with that! For those of you who are looking for something eco-friendly you could try Mattress Organic by Rhintek (8835 Columbia 100 Pkwy). Here you can purchase custom-built organic latex mattresses. Each mattress is tailored specifically to meet your sleep requirements. Be sure to make an appointment as this is a specialized shop. The staff are knowledgeable and passionate- they work hard to ensure that you find a mattress to meet your needs. This is a great option for individuals with allergies. Mattress Firm Laurel is a great place to head if you need to find a mattress near Columbia. You will always receive a 120 day return guarantee and the sales team will not pressure you to purchase. If you are looking for quality and convenience, head here. If you are near Columbia in search of a mattress you could try Bedding Barn in Burtonsville (15595 Old Columbia Pike). The sales team at Bedding Barn help take all of the guesswork out of your purchase. They are very good about answering questions and will help find a mattress that works within your budget. Delivery is efficient and timely. For a convenient and affordable purchase, try Bedding Barn. Looking for a mattress store near Frederick? You could try Gladhill Furniture (10 Walnut St. Middletown, MD). Gladhill Furniture has served the area for over 100 years and offers high quality furniture, mattresses, bedding and more. The staff are friendly, highly knowledgeable, and not pushy. If you need to find a mattress or an entire bedroom set, this is a great reliable option. There are two Mattress Firms in Frederick- Mattress Firm Frederick North (2430 Osprey Way) and Mattress Firm Frederick South (5010 Buckeystown Pike). Both locations ranked highly for customer service and quality of product. Delivery is convenient and timely. If you are looking for a wide selection of mattresses, or just want to shop somewhere with trusted name brands, either one of these locations is a good option. If you want to shop local, try The Family Mattress Shop ( 1100 W Patrick St.) where the prices are competitive and the selection is just as good as the major chains. Here you can find a wide range of mattresses and bed frames. If you are looking for a quality and affordable mattress and want to support a family-run business, definitely try The Family Mattress Shop. If you live on the Eastern Shore, no need to cross that bridge to find a mattress! Mattress Warehouse (2630 N. Salisbury Rd. Salisbury, MD) carries a large number of mattress brands and types like hybrid, memory foam, innerspring, futon, adjustable and more. The staff are extremely knowledgeable and will help you find a mattress to fit your sleeping needs and your partner’s. If you have two different requirements- no problem, Mattress Warehouse has the technology to help you find a mattress that works for all parties. Mattress Firm Salisbury has over 50 mattresses to choose from and competitive pricing. The sales team at this location are helpful, friendly, and do not push you to purchase. You also receive a 120 day money back guarantee. We recommend heading in during a major holiday for a steep discount- try Labour Day.